Some things should never go out of style. Take the family dentist, for example. 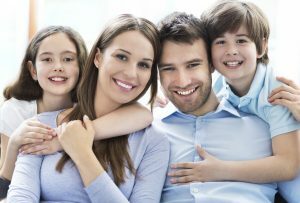 Isn’t it nice to know that you can still rely on one dental professional to take care of all the dental needs of everyone in your family? At Darby Creek Dental, you’ll find the dentist in Marysville, OH, who has the training and experience to treat youngsters, seniors and everyone in between. Whether a patient is two or 92, a dental checkup is always important. Scheduled every six months, these regular visits give our dentists the opportunity to monitor your oral health. We’ll carefully examine the condition of each tooth in order to spot the early signs of a cavity. And once a year we’ll take digital x-rays so we don’t miss decay that may be hiding between teeth or just under the surface. The condition of your gums also plays a vital role in the health of your smile, so we’ll assess your gum health, too. The early signs of gum disease may be imperceptible to you. However, our dentists in Marysville are trained to detect this bacterial infection before it begins to ravage your gums, connective tissue and the bone structure that holds your teeth in place. Of course, a dental checkup is also when one of our gentle dental hygienists will clean and polish your teeth. Afterwards, your mouth will feel refreshed and your smile will look brighter. In addition to dental checkups, Darby Creek Dental offers a number of other services to help each member of your family enjoy a healthy and beautiful smile. If you or anyone else is a sports enthusiast, then we cannot overstate the importance of wearing a mouthguard. This oral appliance is made of smooth plastic and fits comfortably in your mouth to protect your teeth, gums, tongue and lips while you concentrate on your game. Similarly, we can customize a nightguard to help alleviate snoring and sleep apnea. This oral appliance fits similarly to a mouthguard, except that it repositions your tongue and lower jaw in order to keep your airway free so you can breathe easier while you’re sleeping. To schedule a dental checkup for yourself or any other member of the family, call Darby Creek Dental. Our team looks forward to providing you and yours will exceptional dental care.